USER SCORE:76%The percentage of users who liked this based on high quality reviews from sources such as Google Play, iTunes, and Amazon Music. Above 75% is green. ? 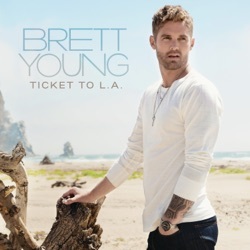 Ticket To L.a. is the second studio album by American country pop singer Brett Young, released by Big Machine Label Group on December 7, 2018. Young and Huff lean into cheerful neo-soul and reconstituted '80s soft rock, giving Ticket to L.A. a breezy, effervescent feel that's entirely ingratiating. In his new album, Ticket To LA, he’s tapping in to his current situation (love!) for some inspiration, and the result is a happy, upbeat and ‘feel good’ album. With plenty of potential singles, crossover appeal and radio-friendly tunes, Ticket to L.A. should take Young to the next level in his career. While Young delved into plenty of heartbreak on his debut project, Ticket To L.A. strikes a decidedly brighter tone. Ticket to L.A. still feels like an authentic Brett Young album, while signifying his progression in sound and maturity. “Ticket to L.A.” will likely be his ticket to country superstardom. A love song? What a surprise... NOT I don’t think he can sing anything but love songs. Switch it up buddy come on. Emotion The emotion in his voice shakes me. He brings his tunes to life. ☹️ Bubblegum Country In case you didn’t know -I don’t like the songs already released on this album. I’m Not even gonna buy the rest of the songs once it comes out. I can only imagine what they sound like- ☹️ He’ll probably be forgotten in a few years.